So I have 2 secrets to share today. First is that over the last few weeks I’ve become obsessed with baked frittatas. You see I’ve always been a big fan of eggs in all their forms, scrambled, boiled and especially poached. And as much as I adore frittatas, I used to cook them only very rarely. I think this was because I always found them a little tricky. Sure they turned out OK most of the time. But I found the juggling act of trying to get the whole frittata cooked through without overbrowning, or even worse, sticking on the bottom of the pan a bit too stressful. But a couple of weeks ago I had a bit of a revelation. I was after something quick and vegetarian for dinner. There were asparagus that needed eating up along with some wonderful eggs from my cousin’s farm. This produced a vision of a beautiful asparagus tart with the spears lined up over the top. There definitely wasn’t time for pastry, and then it hit me. Why not try a baked frittata? So I cooked the asparagus under the grill (broiler) until they were just tender. Whisked together a couple of eggs, lined my smallest springform pan and baked it all for about 15 minutes. And the results were even better than I was hoping. Beautiful to behold, wonderfully delicious AND super simple. Win. Win. Win. The second secret, which you’ve probably already guessed is that baking is the best and simplest way to get perfect frittatas every time. And believe me I’ve been testing the method out. In addition to my lovely asparagus, there has been a breakfast chorizo frittata, a fancy brunch of frittata with potato, sausage & truffle oil, a potato & bacon and this wonderful chickpea & rosemary number. So simple and so good. Do you have a favourite frittata flavour combination? I’d love to hear about it in the comments. A frittata is just an Italian version of an omelette. Having a good frittata recipe in your repertoire is an incredibly useful idea. When you need a quick vegetarian protein hit, there are few things more satisfying. 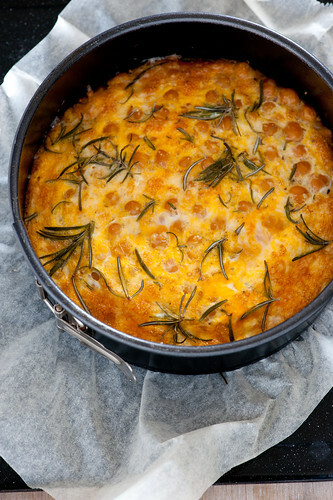 I love this frittata with the fragrance of rosemary and the comfort of chickpeas. It’s all day dining really. Weekend breakfast or brunch? Just add hot buttered toast. Light lunch? Add a green salad. Simple supper? A generous glass of wine and you’re good to go. 1. Preheat oven to 200C (400F) and place a baking tray on the middle shelf. 2. Line a 20cm (8in) springform pan with baking paper & grease generously with olive oil. 3. Whisk together lightly eggs and parmesan. Season. 4. Place chickpeas in the prepared tin. Pour over the egg mixture & scatter over the rosemary. Season. 5. Place on the preheated tray and bake until golden and puffy and the center feels firm and springy, about 15 minutes. Looks so good. Never considered that combination of ingredients. Just can’t wait to try it. Such a versatile dish as you reminded us. YUM! I make a potato, spinach and sometimes throw in some chorizo – so yummy! Thank you this looks great, is so quick, and I like that there are three sources of protein in this. Any recipe that is super quick and utilises legumes is great for vegetarians. Love the springform pan idea – mine just sits in the corner cabinet, all lonely and unused… Great for feeding a crowd. I’ve been doing individual ramekins for us, now that we are just two, but always make an extra so there’s a quick lunch for the next day. I love goat cheese in frittatas. Then again, the best thing about frittatas is you can use just about any ingredient and it’ll taste good. Very versatile! If you don’t have a springform pan, you can make this using a cast-iron skillet. Just grease it with some butter or alive oil and the frittata should pop right out. Erm, that should be “olive oil.” This will teach me to comment on blogs before I’ve had my coffee! I have never tried frittata with chickpeas though but certainly will… Looks yummy! Love, Love, Love the idea of chickpeas in the frittata!! I never, ever would have thought of this (and I consider myself to be a pretty creative cook!) I love that the healthy carb of the chickpeas is right there! Will have to try this. I found your blog a few months ago and have always meant to comment and thank you for sharing your excellent recipes and techniques. I always bake frittatas; that’s the only way I know how to make them. I usually use my cast-iron skillet and they come out lovely. my favorite is probably pepper jack cheese, spinach, and caramelized onions, though I made a lovely cheddar, bacon, and spinach frittata for a brunch party that I’ve been meaning to do again. If you’ve got time to fry up an onion Andrew.. go for it! Frittatas are one of my favorite easy dinners and I make them all the time. The ingredients are highly variable and often include leftovers from some previous meal or the last few somethings from a jar or can. I love feta cheese in a frittata and roasted red peppers are always good. When I want something with a bit more heft, I like to add some cornbread baking mix (like half single batch box) and a little milk. jules, love the site – first time commenting. i too adore frittatas – so easy to make with just about any ingredients! an awesome way to use up a CSA box as well. my summer favorite is to shred and saute zucchini with garlic and onions. my winter favorite is sweet potato and parmesan. I never would’ve thought to make a frittata in a springform pan, nor would I ever had thought to add chickpeas. Though after now, I think I’ll have to try both! Frittata is my go-to easy meal. I usually make with potatoes, mushrooms, onions, red peppers and some greens (ether chard, spinach or kale) and top with some parmesan reggiano. I saute everything first and start on top of the stove and finish under the broiler. I will give this a try, thanks. Great combination, many thanks. I make a simple frittata for dinner most Sunday nights. It uses up the leftovers from our weekend cooking adventures and is easy, mostly healthy and delicious – a few lightly whisked eggs, left over roast potatos or cooked pasta, a veggie, a little cheese, herbs – and I serve it with a glass of wine and sometimes a green salad at our kitchen bench. I bought a non stick tortilla pan from a supermarket in Spain for a few dollars while on holidays a few years ago and carted it back to Sydney. It’s got deeper sides than a usual frypan and is perfect not just for tortilla (delicious but evil!) but also for frittata. And omelettes. so glad you’re enjoying. lovely to hear from a girl who loves her greens! A beautiful frittata! What lovely flavors. Thanks for the fantastic tip on making the perfect frittata. Like you, I’ve struggled in the past to get a frittata to cook in the middle without overcooking on the edges. It’s been impossible so I gave up. I definitely wouldn’t have thought of using a springform pan, but now it seems so logical to bake it. By the way, your frittata looks fabulous. I will have to try this. I can imagine this being great for packed lunches for work. This looks really tasty and the photos are great. You should share this over at http://www.dishfolio.com it would be a great addition. oops, I totally used the wrong sized tin. It kind of turned out like a thin omelette – we live and learn. it’s a great recipe though, thanks for sharing. I’m crazy for frittatas but I’ve been too intimidated to make some myself. I’m going to give it a go as soon as I can get my hands on a spring form pan! Yum – I can’t wait to try it. I LOVE chickpeas. I am also anxious to try your method of baking. Previously, I have had good luck with cooking my frittatas in an oven proof skillet, starting on the stovetop and then finishing in the oven, but luck is the key word. When to make the switch is always a guess. AS I have been lucky, maybe the timing is not that critical, but your method looks much easier and much more foolproof. My favorite frittata has sauteed onions and mixed bell peppers (normally red, yellow and orange) and herbed feta cheese (which it buy already herbed). I serve the frittata drizzled with reduced balsamic vinegar, which is what makes the whole thing really fantastic. Since one of my favorite quick meals is a bowl of chickpeas with aged balsamic and salt, I will undoubtedly try some reduced balsamic on this one too. Thanks so much for all of your wonderful recipes!! My fave frittata is with spinach (or amaranth leaves) with goat’s cheese. Yummy. A baked version sounds so hassle-free! Thanks for the idea. Jules, I tried your recipe and loved it so much that I wrote about it on my blog. I used different vegetables the first time around, but I think I’ll bake your chickpea and rosemary version tomorrow for breakfast! would never have thought of a drizzle of aged balsamic but sounds inspired! Wow – just discovered your blog about an hour ago and have tried the baked frittata with great success. Mine was sweet potato, spinach and feta (with some saute onion and garlic too) One small problem – I think my springform pan is pretty old and doesn’t have a good seal. I lined the base but the egg mixture leaked out a bit. I was trying to work out from your photos how you line your pan. Any tips? you could line the base and sides with foil to prevent leakage. Our favorite combo is goat cheese with ham (and sometimes pineaplle if we are feeling festive) with red pepper flakes! Amazing. We am going to try out your recipe this week. We are making a giant fritatta (as in a 9×13 pan) and taking it to my cousin’s graduation party. Wish us luck! Thanks! Try mini frittattas. They’re easy and fun. Use the same ingredients you normally would, but pour the egg mixture (including cheese) into regular size muffin cups. Next, drop the meat/veggies in so you can control the amounts and the ingredients don’t immediately sink to the bottom. Top with more cheese if you like, and bake for 30 minutes on 350 or 325, depending on your oven/pan. Spray a nonstick muffin tin with nonstick spray, and the “muffins” come out easily after running a knife down the sides and cooling for 5 min. The result is wonderfully moist and evenly cooked. About 8 large eggs and 3/4 cup milk or cream = 12 muffins. The mini size of the frittatta is a real hit at parties. I will never do it any other way now. It’s a fancier look which your guests assume you worked hard to achieve. It’s also easier to vary up or omit certain ingredients if, say, children don’t like mushrooms, asparagus, etc. Make a few basic bacon & cheddar for the little ones. Everyone LOVES the minis… but I notice they do tend to eat more, so make a double batch! ;) If you have overnight guests, saute the veggies and meat ahead of time so it’s ready to go in the morning. Those are my tricks! What an absolute genius idea! I live alone, and as good as the spring form pan idea sounds, I know I’ll get sick of eating it before it’s finished and then not want to make it again. Best tip on varying the flavors!!!! so glad you like the idea Singleton! All of these suggestions sound so good! I don’t own a springform pan and so I was wondering if the ingredients could be baked in a round nonstick baking pan instead? What do you think? A regular baking pan would be fine but make sure you line it with foil or baking paper hanging over the edges so you can get it out of the pan. Even if you grease it the egg tends to stick. I just a little frittata revelation last night, I thought I would share. Basically, that I’ve been calling my frittatas “quiche without the crust,” when in fact, they are frittatas. So, maybe my method is more complicated and more dishes, but it’s perfect and fluffy, and awesome every time. I, also lightly saute’ some veggies in a pan (onion, broccoli, mushrooms, red pepper, whatever). But the difference is that I go through the minor trouble of making a rue for the egg mixture. I saute’ flour in butter, slowly add milk, whisking the whole way, then take off the heat and add grated swiss and parmesan, and the eggs (only forked. Don’t beat the hell out of your eggs if you want them fluffy!). Then I stir in the veggies, and pour into a buttered pie pan, and bake until the cheese rises to the top and splits a little. PERFECT every time. Enjoy! A lot of my egg leaked out of the springform pan – it does not really seal well to liquids. I have the parchment in it. I cover the base with paper so it is overhanging the sides and then jam the lid on the top so the paper is sticking out. This works to keep most if the egg in. I also make sure I get it in the oven asap. If it’s leaking excessively maybe you need a new springform pan? I recently made the perfect frittata: on a hot pan sauteed shallots in butter, added paper thin slices of russet potato to line the bottom of the pan, cooked until tender, then added roasted (oversized) asparagus heads, a generous bunch of arugula, chopped proscuitto, fresh thyme, herbs de provence cooked for a couple of minutes, whisked 6 eggs, heavy cream, and grated provolone, seasoned with salt and pepper, added egg mixture to pan, let it set on the range for a few minutes, grated parmigiano reggiano over the top, finished in the oven for a few minutes. The potato base resulted in a ‘quiche’ like frittata that was out of this world. Flavors were complex and balanced! buon appetito!! Just made this wonderful frittata. (First frittata for me) Since the roasting pan was hot, had room, and I needed to use up some hericot verts, I roasted them with the frittata. What a great, fast, tasty meal. Thanks ever so much. I like to brown some onions, mushrooms, and green bell peppers, top it with provolone and I have a Philly Cheese Frittata. It’s tasty if you like those toppings. Maybe I’m missing the secret here but 5 ingredients???? I read 4!? Eggs, parmesan cheese, chickpeas, rosemary, and olive oil. The olive oil wasn’t listed in the ingredients, but is used to grease the pan. You’ll notice that I hardly ever list olive oil as an ingredient because for me it’s like salt and pepper. Wow you inspired me to buy 6 mini springform tins today, and get my whole family making their own flavour combinations of frittatas tomorrow night (with a few suggestions in mind from this post), i cant wait and i absolutely love your logo and site… your display font is awesome… love the ligatures. Great idea to make mini frittatas Karyn! Mother’s day , we are going to have a family reunion at our home. The family wants to be with grandma . In total We are 10 adults and 11 children. I’m planning to have some frittatas. How many persons can I serve from a 9 inches springform pan? What will be the best oven temperature and time of cooking? Probably if we do two for the kids with mainly bacon and cheese and try two w/ sautéed onions and garlic, prosciutto and goat cheese for the adults? I think I’m too late for mothers day. Hope you had a lovely day. I usually work on 2 or 3 eggs per person. And a 9in pan will probably take about 20-25 minutes, depending on how many eggs you use. Jules- What size springform pan did you use? I’m planning on making a greek frittata with spinach, feta, scallions and dill. There is no call for milk but I add a little it makes it a little richer. I have a 9″ springform pan and was going to make a 8 egg frittata but it seems like it may come out a little thin. I used a 20cm (8in) pan. If you’re using a 9in you’d need 10-12 eggs, depending on the amount of other flavours. After hunting around for some frittata recipes I found one that recommended starting the frittata on the stovetop on a low temperature – covered so the top starts cooking. Once the bottom is just about cooked pop the pan in the oven on a low broil for a few minutes. My frittata came out perfectly cooked the eggs didn’t overcook and turn brown like yours did in the picture above. I highly recommend that you try out this other technique. All the best! Just had to say that the browning of the eggs on top is perfection, not a drawback, in my view. It looks rustic and beautiful and gives the eggs a wonderful flavor. Traditional frittatas are often popped under the broiler for the last few minutes expressly to get that beautiful brown. I have to agree with liz on brown eggs – think browned eggs taste terrible, but I love the springform idea of cooking this. So, I think I will try the springform, but put some cheese on top so the egg top doesnt brown – just the cheese does. One of my favorites is a Greek frittata with spinach, Greek olives, red and yellow peppers and feta. Very flavorful and colorful! Could you post that recipe please? Your frittata looks scrumptious. I just took a look at the eggs in my refrigerator. The labeling on European eggs is different from what you described, as I have now discovered. They come in sizes L, M and S, which refers to weight, and each individual egg has a stamp showing country of origin, code number of egg farm, and a code showing whether hens were organically raised, raised in cages, or raised with ground contact. The outside package shows how long they’ll keep. There doesn’t seem to be any grading of quality. Interesting! A friend suggested that leftover Cilantro Chicken (a Vietnamese dish) would be great in a frittata. Boy was she right! The main ingredients of Cilantro Chicken are cilantro and chicken, of course, and bean sprouts. I do not like by eggs that brown on top for me the texture is gross. It should be creamy on top and light golden on the bottom IMO. I use 6 large eggs per 10″ skillet. I made a proscuitto, spinach,tomato, pine nuts and parm cheese in one, and used bacon, cheddar, tomato and green onion in another. They are great for a wheat free lifestyle. I make them and eat them for breakfast, lunch or dinner. So far I have made mine on the stove top. I see endless choices with these argula, leftover veggies, zucchini. What do u mean by season? Do u use oil in this recipe? I bought a big can of chickpeas from Costco to make a large batch of hummus, but I still have LOTS leftover. This frittata looks delicious and is a great way to use up the leftover beans. It’s going on my meal plan for next week – thank you! This sounds like a great idea of a recipe. How do I make it from scratch as well? Because I would love to make this for my Grandfather for father’s day this year. And this sounds like something I rather make on my spare time. Just pulled one out of the oven, asparagus, mushrooms, shallots and goat cheese. YUM. Last week it was linguica, spinach and ricotta cheese; those pockets of whole milk local ricotta were wonderful, even the dog forgot he did not like spinach. I had this for dinner, and like it very much. THANK YOU? This frittata was amazing. I followed the recipe exactly, but I just doubled it. Quick tip: some garlic salt and pepper really brings out the flavor of this. Also I don’t have a springform pan so I just used a medium sized casserole dish to bake it in. Next time though I’d probably add in an additional spice or two or even another vegetable like spinach or something.